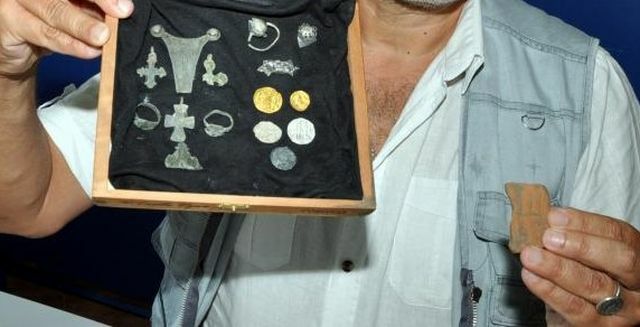 A monogram of Bulgarian Tsar Mihail III Shishman Asen (r. 1323-1330) and a number of coins of the Bulgarian Tsars from the 14th century AD, the last decades of the Second Bulgarian Empire (1185-1396 AD) before it was conquered by the invading Ottoman Turks, have been discovered by the team of archaeologist Nikolay Ovcharov during the excavations of the ancient and medieval rock city of Perperikon. The newly found monogram of Tsar Mihail III Shishman is a ceramic depiction of the Bulgarian (Cyrillic) letter “Ш" (which corresponds to “sh" in English). According to Ovcharov, the same monogram was depicted on coins and other items by another Tsar of the Second Bulgarian Empire – Tsar Ivan Shishman (r. 1371-1395 AD). Tsar Mihail III Shishman’s monogram has been found on the broken-off handle of a clay vessel during the recent excavations at Perperikon – an ancient and medieval rock city located in the Eastern Rhodope Mountains in Southern Bulgaria. 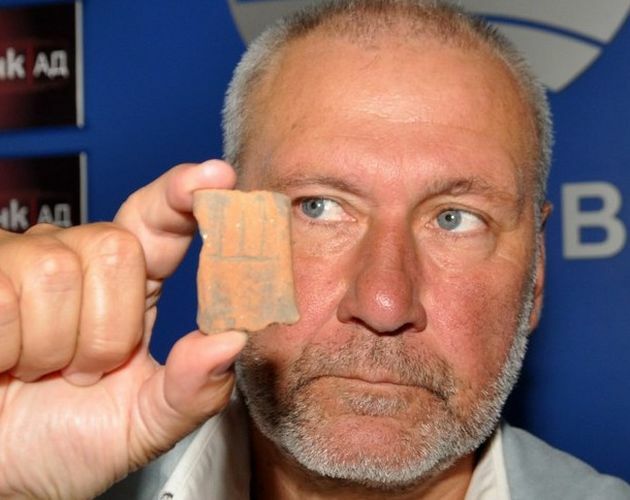 “We found the monogram a couple of days ago, and even though it is a simple ceramic fragment, it is actually quite important from the point of view of history because it is the first piece of historical evidence for the presence of Bulgarian forces in Perperikon’s region during the 14th century," says Ovcharov, as cited by local news site Darik Haskovo. He adds that in the three months since the start of the 2015 summer excavations at the beginning of June his team has come across numerous finds – such as crosses, ear-caps, gold and silver coins. “We have found more than 10 silver coins which were minted by the Tarnovgrad (Veliko Tarnovo) mint of Tsar Ivan Alexander (1331-1371 AD). 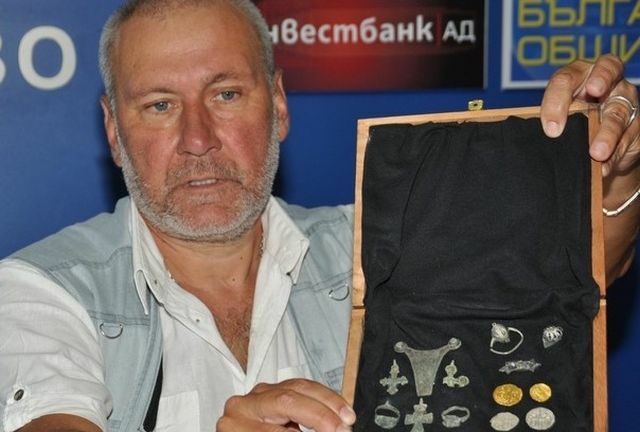 These coins were hardly in circulation, and most probably they were used to pay the garrison which proves the presence of the Bulgarian troops in Perperikon in 1343 AD," explains the archaeologist. These finds are seen as important because the geographic region of Thrace, and especially the region of the Rhodope Mountains where Perperikon is located, were among the first territories in Bulgaria, and Europe, for that matter, which were conquered by the Ottoman Turkish invaders in the 14th century AD. Ovcharov also says that by mid September his team is going to unearth in full the acropolis of Perperikon. He reminds that in September 2014, the local authorities in Kardzhali completed an EU funded project for excavations and improvement of the tourist infrastructure of the prehistoric, ancient, and medieval rock city of Perperikon which was worth a total of BGN 3.7 million (app. EUR 1.9 million). Additional funding will be invested in the archaeological site from the EEA and Norway development mechanism. Kardzhali Municipality recently won an EEA/Norway grant for the partial restoration of Perperikon, which is worth EUR 748,203. The project entitled “Perperikon – Past for the Future" provides for the restoration and exhibition of a total of 11 structures: 3 altars, 4 residential buildings, a water tank, the fortress wall of the Perperikon acropolis with 2 bastions, a polygonal fortress tower, and streets in the ancient and medieval city. The archaeologist points out that the archaeological restorations at Perperikon will be “unique" because they will feature structures from different time periods in one place: Prehistory, Bronze Age, Antiquity (Ancient Thrace and the Roman Empire), and the Middle Ages (the Bulgarian Empire and the Byzantine Empire). Ovcharov has also revealed the revenue generated by Kardzhali Municipality over the past year from the tickets sold to tourists visiting the rock city of Perperikon amounts to BGN 200,000 (app. EUR 102,000). He believes that it will be possible for the cultural tourism site to become self-sustaining financially in the near future.